Among the many fields of research and medicine aided by next-generation sequencing, few have seen a greater impact than the study of rare inherited diseases. Hundreds (certainly) or thousands (probably) of new disease-gene relationships have been reported in the past several years, causing exponential growth in databases like HGMD and ClinVar. The growth is also evident from simply perusing the table of contents of peer-reviewed genetics journals, which typically feature at least a handful of new disease-gene reports in every issue. In the early days of MassGenomics, I even tried to keep track of new gene discoveries enabled by exome sequencing, but that quickly became untenable. There’s no way to keep up. However, I think the occasional snapshot of recent discoveries can tell us a bit about how exome sequencing is being applied to rare disease research. I collected six such studies, three each from the journals of American and European human genetics (AJHG and EJHG). I required that they be exome sequencing and convincingly implicate a single gene. From these, I summarized the phenotype, study design (i.e. who was sequenced), some notes on the analysis, the genetic finding(s), and the supporting evidence presented. Most of these were disorders with presumed recessive inheritance, but the first example is a fascinating exception. Ewans et al studied a family in which the parents (healthy) had six daughters, four of whom intellectual disability with epilepsy. That might have been a combination of recessive disease with very bad luck, or something else. The authors performed exome sequencing on two affected daughters and prioritized shared variants that were very rare (MAF<1% and never seen in dbSNP) and predicted to be damaging. Because the inheritance pattern was unclear, they considered all possible inheritance patterns. The number of variants uncovered was not provided, but the authors They identified a heterozygous frameshift insertion in IQSEC2, an X-linked gene already associated with intellectual disability and seizures. All affected daughters had the insertion, but neither of the parents did. This appears to be a case of gonadal mosaicism, since the odds of a recurrent de novo mutation at the same place are vanishingly small. The parents declined further testing that might determine whose germline had the mutation (I don’t blame them). Peric et al describe a study that was part of the MYO-SEQ project, in which exome sequencing was applied to 91 unrelated Serbian patients with unexplained limb-girdle muscle weakness and elevated serum CK levels. Of those, 19 had a predominantly distal phenotype, and 14 of them carried a specific nonsense variant believed to be a founder mutation. The gene is titin (TTN). Now you probably understand the click-baity section header. At over 30,000 amino acids, titin is the largest known protein-coding gene in humans, and as a result, comes up in genetic analyses all the time. In cancer genomics studies, we often see it when searching for recurrently mutated genes. However, it’s considered an effect of the gene’s massive size, and usually written off. The gene is so large that trying to view it in the gnomAD database gave me a network error. All 14 Serbian patients were either homozygous for this variant, or compound-heterozygous for it and another truncating variant. The variant appears to segregate on a ~1 megabase haplotype in individuals of Serbian ancestry, suggesting that it’s a founder mutation (i.e. can be traced back to a common ancestor). I can’t even count the number of times I’ve been in a meeting where an under-powered genetic study is being discussed, and someone says, “Maybe we’ll get lucky.” However, I *can* count the number of times we actually did. Zero. But it does happen, as illustrated by Nazli et al. They sequenced an individual with a complex encephalomyopathy / suspected mitochondrial disease and her healthy sibling. Prioritizing variants with MAF<3% that were homozygous in the proband but not the control yielded 13 candidate variants (I have no idea why this arbitrary MAF threshold was used, or why compound hets weren’t considered). Only one variant affected a gene, TMEM65, that localizes to mitochondria. The variant itself disrupted a splice site and was heterozygous in both parents. So far, so good. To their credit, the authors carried out a series of functional assays to demonstrate the gene’s key role in mitochondrial respiratory chain function. Ta-Shma et al have a study that takes advantage of clever ascertainment: two unrelated families in which patients suffered a remarkably similar severe phenotype (CNS, cardiac, renal, and digital anomalies) and were the result of a consanguineous union. In family 1, an Ashkenazi Jewish pedigree, the child had unfortunately passed away, so the authors sequenced the parents to search for shared rare heterozygous variants. In family 2, an Arabic pedigree, only the mother and affected child were available. It turns out that the unrelated patients from both families had another thing in common: homozygous truncating mutations in TMEM260. An extensive (and impressive) set of experimental follow-up work –including CRISPR/Cas9 zebrafish experiments and immunocytochemical/biochemical studies — demonstrated that the disorder arose from nonsense-mediated decay of a specific isoform of the gene. Tawamie et al had access to an entire cohort of consanguineous families affected by presumably-autosomal-recessive intellectual disability (ID). A data sharing consortium allowed them to identify homozygous missense variants that segregate with ID in two unrelated families. One was a family of Kurdish descent in which only the proband was sequenced, and regions of homozygosity were used to prioritize candidate variants. The other was a family of southern Italian origin with two affected siblings. Both were sequenced, and shared the same homozygous variant. Given the genetic evidence that TAF13 played a role in ID, the authors performed an interesting experiment to assess its role during development. They used siRNA to suppress the gene in human neuroblastoma cell lines, and then applied RNA sequencing. Over 1,200 genes were deregulated in the knock-down cell lines compared to controls, suggesting an important role for TAF13 in development. Mingchu Xu et al conducted a very nice study of 10 affected individuals from 7 families of various ancestries. All had a similar phenotype of retinal degeneration with some additional developmental anomalies. Although unrelated, all of the affected individuals had recessive-acting truncating mutations in CWC27, a component of the spliceosome. Two allelic mouse models (created with CRISPR/Cas9) showed that biallelic loss caused lethality and/or a severe phenotype, whereas partial inactivation caused only a retinal degeneration phenotype. This mimics the range of clinical presentations remarkably well, and highlights the complexity of the spliceosome network in human disease. Complex encephalomyopathy (mitochondrial) Discordant siblings Segregation, MAF<3%, Control Exomes TMEM65 Splice Site Recessive Immunofluorescence/immunoblotting, siRNA knockdown, subcellular fractionation, MT function (enzymology, protein abundance, O2 consumption). I’m struck by the diversity of study designs — from individuals to small families to cohorts of unrelated patients — that enabled these discoveries. I’m also impressed at the careful experimental work (especially in the last four studies) that was done to functionally validate the findings. Studies like these set a high bar for publication-worthy manuscripts, but also provide useful models for unraveling the genetic basis of severe inherited conditions. As long-time readers of MassGenomics probably know, I’m fascinated by studies that interrogate functional elements of the human genome. The ENCODE Project is perhaps the most visible consortium effort in the United States, employing a variety of high-throughput genomic technologies such as RNA sequencing (expression), DNase I sequencing (open chromatin), and CHiP-Seq (DNA-protein interactions). However, other groups have made major contributions recently, notably RIKEN-led FANTOM consortium. In the past few years, FANTOM researchers have applied Cap Analysis Gene Expression (CAGE), a genomic technology developed at RIKEN, to numerous mammalian cell and tissue types. CAGE isolates the 5′ end of long RNA molecules, providing high-resolution mapping of the transcription start sites and core promoters of genes. The current project iteration, FANTOM5, has mapped enhancers and transcription start sites in hundreds of primary human cell types. This week in Nature, they’ve published another genomic annotation: an atlas of long non-coding RNAs with accurate 5′ ends. By integrating 1,829 CAGE profiles from the FANTOM project with transcript models from a variety of sources (GENCODE, Human BodyMap, ENODE, and miTranscriptome), the authors constructed a “CAGE-associated transcriptome” assembly cleverly branded FANTOM CAT. The 27,919 long noncoding RNA genes in FANTOM CAT represent the most comprehensive catalogue of human lncRNAs so far. The authors next sought to classify lncRNA genes according to genomic and epigenomic context. I found the way this was presented in the paper to be very confusing, so I’ve broken it down differently here. Adapted from Hon et al, Nature 2017. Divergent p-lncRNAs (n=5,827) have promoter-like epigenomic signatures and use the same TSS as a known messenger RNA, but are transcribed in the other direction. Intergenic p-lncRNAs (n=1,725) also have promoter-like epigenomic signatures but do NOT use the same TSS as a known messenger RNA. e-lncRNAs (n=9,339) have enhancer-like epigenomic signatures (genomic context is ignored). These are the orange slice from the top pie chart. 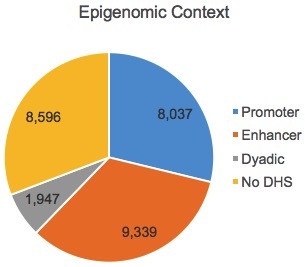 There were also 10,543 lncRNAs that had have dyadic or undefined epigenomic signatures, or that had a promoter epigenomic signature but were antisense or intronic. These “other” lncRNAs are essentially set aside; in most of their analyses, the authors compare/contrast the three lncRNA categories described above with traditional mRNAs. One way to assess the functional relevance of a genomic region (or set of regions) is to assess the extent of evolutionary conservation across species. In this study, the authors examined whether the transcription initiation region (TIR) and exonic sequences were conserved for each class of lncRNA gene, using mRNAs as a comparator. This type of analysis was motivated by something that I did not know: at some lncRNA loci, the mere act of transcription is functionally relevant, but the actual sequence of the transcript is not. The image to the right (adapted from Figure 1c) shows the proportion of transcription initiation regions (Y-axis) and exonic regions (X-axis) that overlap GERP-predicted conserved sequences for mRNAs (red), divergent p-lncRNAs (purple), intergenic p-lncRNAs (blue), and enhancer-lncRNA (green). Classic mRNAs, as expected, show conservation at both the TIR and the exonic portions. In general, exonic regions from all three lncRNA categories were less conserved by comparison. Divergent p-lncRNAs showed high conservation for the TIR (75%) and a reasonable amount for the exon (54%), but remember that their “exonic” portion, by definition, is immediately upstream of an mRNA core promoter. In intergenic regions, 42% of promoter-like lncRNAs and 36% of enhancer-like lncRNAs did not overlap conserved elements. Interestingly, those non-conserved intergenic TIRs were significantly enriched for retrotransposons, suggesting that retrotransposon activity contributes to the “birth” of new transcription activity in noncoding regions. Enhancer-lncRNAs were also much more likely to be cell-type-specific, which is consistent with previous studies of enhancer activity. 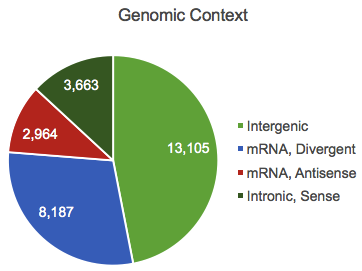 On average, 5,666 lncRNA genes were expressed in each cell type, though the range was fairly wide (3,000-10,000). I notice that many of the higher-activity cell types in the bottom panel are immune cells (basophils, NK cells, etc), which makes sense. 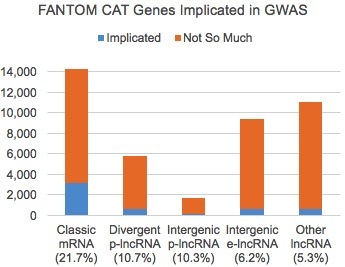 The authors cross-referenced lncRNAs from FANTOM CAT with established GWAS loci, finding that 40.7% of lncRNA genes were associated with at least one trait. 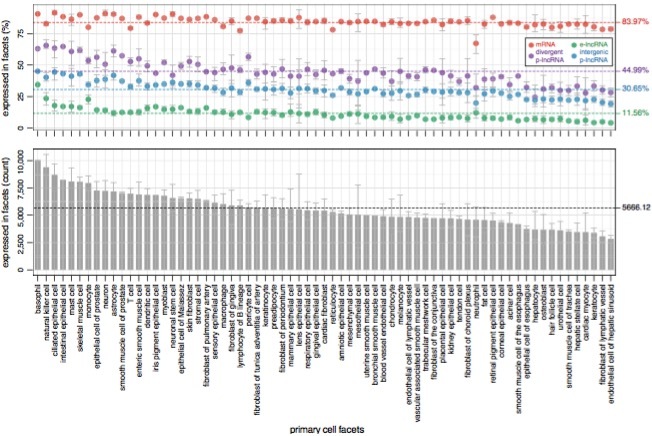 Unsupervised clustering of cell-type-specific lncRNAs and trait associations showed that related cell types and traits tend to clump together in biologically plausible ways: for example, lncRNAs enriched in nervous system tissues tended to be associated with neuropathy and behavior traits, and the odds ratios of lncRNA genes were comparable to those of mRNA genes. As we might expect, protein coding genes had the highest proportion of associations (21.7%), and they were about twice as likely as divergent/intergenic p-lncRNAs and thrice as likely as enhancer-like lncRNAs to be involved in a cell type-trait association. 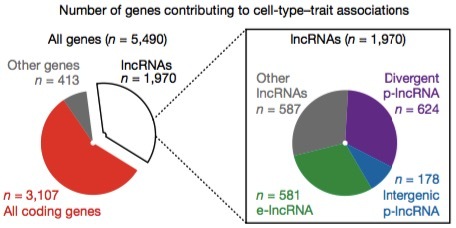 Even so, given the massive disparity in research emphasis, I find it compelling that considerable numbers of lncRNAs are implicated in human traits. It suggests that all of those noncoding genetic associations are not random, but indicative of the intricate regulatory genetic networks underlying complex human traits. Furthermore, it highlights the importance of divergent p-lncRNAs, which utilize the same TSS as protein-coding mRNAs but are divergently transcribed. Given their close proximity and the tendency of investigators to assign a GWAS hit to the nearest protein-coding gene, I wonder how often a genetic signal from a p-lncRNA is erroneously assigned to the mRNA instead. As you probably know, I’m a fan of exome sequencing, particularly for studies of rare inherited disorders. While not a perfect (or comprehensive) assay, exome sequencing offers an efficient screen of the regions most likely to harbor disease-causing mutations. Ironically, another reason people like exome sequencing is because of the limited scope: it essentially doesn’t interrogate the regions (noncoding) and variant types (SVs) that are more difficult to interpret. Several large scale whole-genome sequencing studies of human disease are hurtling forward in the U.S., the U.K., and other countries. We’ve put it off as long as we can, but now we’re faced with the daunting task of identifying and interpreting biologically-relevant variants outside of protein-coding exons. There’s good reason to do so, by the way, especially studies of common disease in which regulatory activity is likely to play an important role. Many, if not most of the genomic loci associated with human traits lie in noncoding regions. According to datasets generated by projects like ENCODE and FANTOM5, noncoding regions also exhibit an astonishing amount of biochemical activity suggestive of diverse functions. Sometimes with a daunting analysis task, it’s hard to know where to start. Fortunately, there’s a nice paper in the upcoming issue of AJHG that provides some practical guidance. Alanna C. Morrison et al present a series of integrated steps for whole-genome analysis and apply them to study 10 heart- and blood-related traits in 1,860 African Americans. In pre-defined regulatory domain motifs (promoters, enhancers, and UTRs) near genes. You’re looking at the association of Lp(a) levels in the well-known LPA gene locus. The sliding window approaches nicely captured association over the LPA gene region, but also in other nearby regions, some of which were also supported by the first-intron or regulatory-motif analyses. It’s a complicated picture, to be sure, but it suggests some specific areas in which noncoding variants are exerting a cis-regulatory effect on the LPA gene. Very cool stuff. This study demonstrated both the feasibility and the justification for interrogating noncoding regions for association with medically important traits. Imagine how much we’ll be able to discover as we get our hands on massive WGS cohorts, and extend these principles to other regions and regulatory motifs of the genome. Exome sequencing has undeniably transformed the study of rare inherited disorders, enabling the rapid identification of hundreds of new diseases genes in the past few years and spurring the adoption of clinical exome sequencing as a frontline diagnostic tool. That’s great news. Hooray for the exome! Is it a fantastic discovery tool? Absolutely. But it’s not a magic bullet. The less-publicized outcome of widespread exome sequencing is that “hit rate” — the proportion of sequenced cases for which a likely genetic cause is found — has largely remained the same. For most studies, it’s in the neighborhood of 40-60%. Higher success rates have been reported, but these usually involve cherry-picking cases or the inclusion of patients who who’d not undergone any a priori molecular testing. The bottom line is that a significant fraction of rare disease cases fail to achieve a genetic diagnosis by exome sequencing. When this happens, it’s tempting to consider whole-genome sequencing as the logical next step. Yet it’s hard to know how often that will help. A new study in the American Journal of Genetics has begun to answer that question. Keren J. Carss et al performed exome sequencing, genome sequencing, or both on 722 patients with inherited retinal disease. IRDs offer a number of advantages for studies like this due to exceptional phenotypic, genetic, and allelic heterogeneity. There are more than 250 known genes associated with IRDs, and they can be inherited in every possible mode. Dominant, recessive, X-linked, and even mitochondrial inheritance have been documented. 311 had retinal pigmentosa (RP), characterized by night blindness and progressive rod photoreceptor loss. 53 had cone-rod dystrophy, which affects cone photoreceptors, causing loss of color and perceptive vision. 45 had Stargardt disease, the most common form of inherited juvenile macular degeneration. 37 had macular dystrophy, a broader term for diseases affecting the macula, the central portion of the retina. 37 had Usher syndrome, a condition characterized by vision loss (RP) and hearing loss. Too often, I see a paper with “Whole-genome sequencing” in the title in which a handful of samples actually obtained WGS, and the rest got targeted sequencing. Although I understand the economics of such a design, it feels like a bait-and-switch. This study did not disappoint: 650 of 722 cases underwent WGS, with the remaining 72 getting exome only. The average depth for WGS was 37x, which is standard, but the average exome depth (43x) is a little low. That’ll be relevant in a minute. The bioinformatic analysis and interpretation strategies look solid. The authors searched for high-quality rare coding variants in a curated set of 224 retinal disease genes. Candidate causal variants were reviewed in IGV, and assessed in the context of databases (like HGMD), segregation, and how well the clinical phenotype matched the phenotype associated with the gene. They identified a likely causal variant in 404 individuals (56%). That’s slightly on the high end of realistic success rates, but as the authors admit, 152 individuals in the cohort had had no prior genetic testing (and 63% of them were solved). The hit rate also varied by phenotype. RP, the largest phenotype group, saw a hit rate of 54% which is right where we expect it to be. The success rate varied widely for other phenotypes, ranging from 29% in cone-rod dystrophy to 84% of Usher syndrome (the latter is not terribly surprising, since variant interpretation is arguably the easiest for rare, recessive conditions). Higher genetic diversity in African populations, combined with underrepresentation of non-European populations in control datasets, result in an excess of rare and apparently rare variation in these individuals, rendering variant interpretation more challenging. Another intriguing ancestry tidbit was that 66% of pathogenic variants in South Asian cases were homozygous, compared to 18% of pathogenic variants in European Americans. The authors argue that this is likely due to greater consanguinity in South Asian populations, which may also explain why their hit rate was comparable to that of European-ancestry individuals despite underrepresentation in control databases. Some 117 individuals underwent exome sequencing first, and in 59 of those (50%), a likely causal variant was uncovered in this first pass. Next, the authors selected 45 of the 58 exome-negative individuals for whole genome sequencing. Of these, 14 cases, or 31%, achieved a genetic diagnosis after WGS. But take note of the reasons those variants were missed. 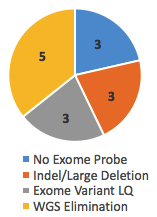 Three of them had no probe (and thus no coverage) in the Nimblegen v3 exome kit and 3 were large indel/deletions missed by exome sequencing. Another 3 were called in the exome but flagged as LQ (low quality), likely due to poor coverage or representation of both alleles. In these 9/45 cases (20%), WGS did succeed where exome failed. Yet the remaining 5 variants were called in the exome, but not considered causal until WGS eliminated all other possibilities. Should these go in the win column for WGS? I’m not sure. If they aren’t, then the true discovery rate for WGS in exome-negative cases in this study is 20%. In this case, a patient with recessive RP had one pathogenic variant (a missense change in EYS) detected by exome sequencing. However, it took whole-genome sequencing to identify the second disease allele, a heterozygous ~55 kb deletion spanning at least three other exons in the gene. 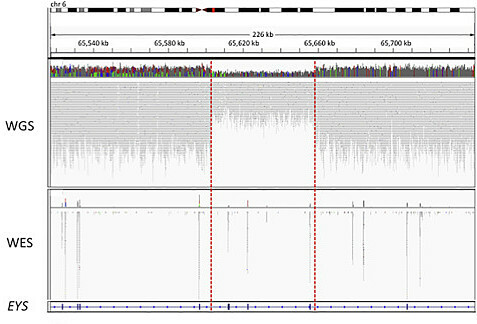 In 16 individuals with Stargardt disease, caused by recessive-acting variants in the ABCA4 gene, the authors identified a rare intronic variant. It was homozygous in two cases, compound-heterozygous with a coding variant in nine, and the only ABCA4 variant in the remaining 5 (which are classified as “partially solved” cases). In a patient with Usher syndrome, the authors identified a known pathogenic noncoding variant (intronic) that causes the retention of a pseudo-exon. In two unrelated males with choroideremia, an X-linked disorder caused by mutations in the CHM gene, the authors uncovered a novel deep intronic variant creates a cryptic splice site that causes retention of a 224-bp cryptic exon. For all three regulatory variants, the investigators knew where to look because the patient’s phenotype strongly pointed to a known gene. This is a clever strategy for beginning to tease out regulatory variation in Mendelian disorders, and may help open the door for even more discoveries. This was a well-written paper that showcased some of the advantages to whole-genome sequencing over exome sequencing for uncovering the genetic basis of rare diseases. I hope (and expect) we’ll see more studies like it as WGS becomes ever more practical to apply as a frontline diagnostic tool.